I enjoyed Knit & Crochet Blog Week so much last year, I thought it would be fun to take part in it again this year! Today's topic is about color. What do you go for? What do you like? I think the major thing I see there is solid. 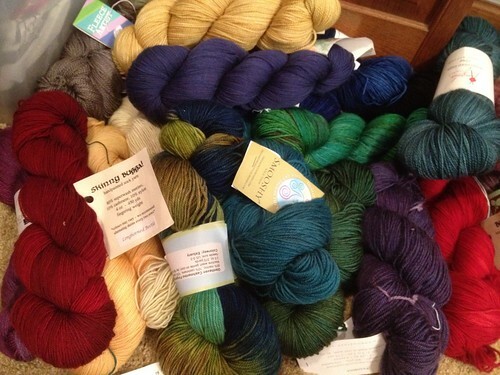 Now that most of my knitting projects are my own designs, I find myself gravitating towards the solids and semi-solids. They show off your design way better than a variegated yarn! As for my finished objects...I see a lot of solid there too. What can I say? I have become a sucker for a really good solid/semi-solid yarn. Come back tomorrow for Day 2 of Knitting and Crochet Blog Week. It's Photography Challenge Day!